JAZZ PIRATES of the Southern Archipelago outside Gothenburg, Sweden, started in 2004. 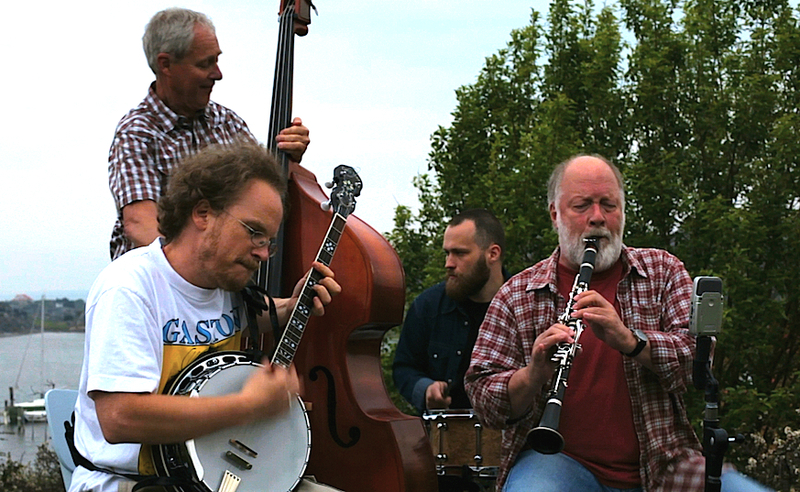 The musicians are Lasse Collin, clarinet, Mathias Gustavsson, banjo/guitar, Leif Melldahl, bass, and Felix Collin, drums. Our inspiration is the many great small bands playing New Orleans music in the early days, especially with a clarinet in the lead. The tunes we play come from the whole field of the New Orleans repertoire; old goodies from back then, classic dixieland tunes, caribbean tunes, blues, ragtimes, marches, hymns and gospels. Most of all we like playing tunes in the Creole/Caribbean style and rhythm, to us representing the more genuine African roots of jazz music. Nice melodies, played in a simple, unpretentious way, always hot, always swinging. That's how we want it. Welcome to enjoy our site and the music we put out here. LATEST SESSION APRIL 9, 2019.